Last Monday, 22 April, saw the launch of the new UK Chronic Fatigue Syndrome/Myalgic Encephalitis Research Collaborative (CMRC). Set up by Stephen Holgate, MRC professor of immunology, and backed by the UK's main research funders (MRC, Wellcome Trust and NIHR) it aims "to create a step change in the amount and quality of research into chronic fatigue and ME”. The launch featured some eye-catching provisional results that got good media coverage, particularly the study from Newcastle showing differences in lab-cultured muscle from CFS patients versus healthy controls. And an fMRI study found that patients had to use more brain regions to accomplish the same mental tasks as controls, confirming earlier work in this field. What's not to like? Well, although it's backed by most ME charities and almost all the UK's biomedical researchers, the collaborative is deliberately a broad church including all types of research, including psychological research. And that has upset a good number of patients (as you can see on this thread: "read and weep..." was one pithy objection). Action for ME, AYME, the Chronic Fatigue Syndrome Research Foundation, The ME Association and ME Research UK all agree. The most significant ME charity choosing to remain outside the tent for now is Invest in ME, who have voiced their scepticism, arguing that what's needed is exclusive focus on biomedical research. Nonetheless, it was an extraordinary achievement to bring together such diverse views into a single collaborative. As Stephen Holgate says, "It is the first time this has ever been done anywhere in the world—to get buy-in from these different communities”. A new era of Research in the UK? "a field that is in desperate need of new science"
The application of state-of-the-art research methodology, including Genomics, Proteomics and Metabolomics. Using the new Networks approach as powerful tools for integrating and modelling biological data. This systems-based medicine approach focuses on how biological systems interact within the body, rather than looking at changes in individual genes or proteins. Nancy Klimas's Neuro Immune Centre in Florida, with Gordon Broderick providing network modelling, is a great example of this. Emergence of large collections of biobanks. eg The UK ME-CFS Biobank and the CFI bio-bank in the States. Such well-characterised patient groups, with clinical and biological material, open the way to large-scale studies probing any number of biological mechanisms. Holgate also wants to engage a wide range of new fields such as maths and environmental science who could all add to the party. As he's said repeatedly in recent years: "The key to success will be the engagement of scientists outside the field", drawing new blood into CFS research, bringing insights from other diseases, and encouraging young new researchers to study ME/CFS. Similarly, the MRC stresses the importance of proposals for research funding to include at least some researchers new to the field. And the MRC, who were at the launch, has a highlight notice encouraging specific biomedical areas, including neuropathology and immune dysregulation. One other important area discussed was heterogeneity and case definitions, which is a big issue for the whole field. Stephen Holgate referred to CFS/ME as a 'complex group of conditions' ie multiple conditions with different aetiologies, and so 'phenotyping' - dividing patients into different groups on the basis of clinical information, or even biomarkers - is a priority too. How will the new Research Collaborative make a difference? It's still very early days for the research collaborative and the organisers hope that many new researchers will join the CMRC and help shape its future. However, it's already been agreed that there will be quarterly meetings between researchers and funding charities, divided into four different streams. The content of those streams will be decided at the first meeting of the CMRC on May 22nd. This meeting will also firm up research priorities, and a fundraising drive will be on the agenda too. An annual CMRC science conference is also possible, but with such a new organisation, much remains to be decided. Stephen Holgate knows that some patients will continue to doubt the value of the new Collaborative, and anything he says is unlikely to change their minds. However, he hopes that the efforts of the collaborative, and ultimately the results of new research stemming from it, will persuade those patients that this venture will be making a big contribution to understanding ME/CFS. There are many ways you can help Phoenix Rising to continue its work. You can even donate significant sums, at no cost to yourself, as you shop online! To find out more, visit Phoenix Rising’s Donate page by clicking the button below. Thanks, Simon - great article. I think a lot of us in the UK are simultaneously feeling excitement and caution. There's a lot of potential for great progress there but the psychological school has a very powerful grip on the media and the medical establishment and is deeply vested in its position. I think it's going to be a very interesting first six months with what have been seen as opposing forces inside that same tent and I'm looking forward to seeing what will come out of it. Yes, we don't know how things will turn out, but I am optimistic this will be very good for biomedical research. Stephen Holgate has been a key figure working in this for several years - as head of the MRC CFS/ME Expert group before this. That too involved both biomedical and psychological researchers, yet the main thing to emerge from it was the MRC's first ever ring-fenced fund for biomedical research. With him as Chair I don't think there is much danger of it being 'hijacked'. At the same time I don't think there has to be a problem with having researchers with competing viewpoints in the same collaboration. There are researchers with competing viewpoints in many fields, and even where researchers share a similar viewpoint there can be immense competition between them (virology, for instance, has been described as a 'contact sport', which is perhaps one reason why the whole XMRV thing became so heated). This isn't necessarily a bad thing, and such competition can drive research to greater heights. Arguably one thing CFS has lacked has been robust testing of competing hypotheses, and such rigorous testing playing out in journals could be a positive step. What would help is all researchers working together to maximise interest in and funding for their field and hopefully that will happen here. It should be an intersesting ride. Nice one Simon. Another good article for PR... you're on a roll now. I'd certainly like to see a robust testing of hypotheses for CFS - ideally before they'd been allowed to affect how patients are treated. Thanks Simon, a very well-pitched article! And informative, as always! I am cautiously optimistic that this collaborative will be a positive thing on balance. Sure, we'll continue to get some dodgy science in the UK, some of which may even come from within this collaborative, but we know that we'll get some good research from this collaborative too, because some of the people involved have already shown their support for ME/CFS being a physiological condition. It's also very hard to change things from outside as you dont real dialogue with those people who hold conflicting views, if you are not involved and when those people inside have the attention of the press and you dont, so hopefully this collaborative will be beneficial in that regard – Newton’s muscle work already being covered in the Times, to me, seems like quite a big step forward. I agree - although I'm cautious I think it's a great idea to have everybody in the same tent because each camp gets exposed to evidence on the other side. Edit: There seem to be a lot of camping metaphors creeping into my prose! I just have one little itty bitty question: How much money did they budget for research? Should ME/CFS charities that fund/support research be joining the UK Research Collaborative? Tiny sample, though not quite the ringing endorsement the charities were presumably hoping for. I'm surprised so many people are voting 'definitely not' - so far I can't see any reason why the MEA's involvement is a bad thing. I rarely go for 'definitely' anything! I went for 'yes - with caution'. I understand people being wary though, given the way it was promoted, failure to acknowledge past problems, and some of the people involved. I am beginning to despair at the way I keep having to correct internet misinformation about the new UK research collaborative. Firstly, the collaborative is bringing EVERYONE together who is involved in ME/CFS research - that includes ALL specialties, new and potential researchers, research funding (or supporting) charities, respresentatives of the pharmaceutical companies (in due course) and government (MRC, NIHR, DoH). So the membership will be right across the spectrum from neurology and immunology to psychiatry and psychology. Nobody is trying to hide anything. It is forum where the whole spectrum of opinion is involved - which is why many of the well known names across the research spectrum were at the launch meeting at the Wellcome Collection last week and some of them will be more actively involved. It is, as I keep saying, a very big tent and the ME/CFS charities that are signing up to join (I think the number is now 7) accept that this is the case. Secondly, it is quite likely that the UKRC is going to play a major role in stimulating new research funding, new research infrastructure (bricks and mortar) and academic acceptance of ME/CFS in hospitals and universities (something that is very sadly lacking at present). We believe it is is better to be inside the tent putting your point of view than complaining about what is happening from outside the tent and (in some cases) trying to drown this initiative before it has even started to swim. Thirdly, this means that there will be differences of opinion being expressed among those involved. This has already happened. But that is how the scientific process works and moves forward and we (ie MEA) want to be involved in this process and debate. I am not afraid of stating what I believe. Fourthly, being a member of the UKRC does not mean that a charity can no longer make constructive criticism of the PACE trial, the Lightning Process, NICE or any other topical issue. Our position on NICE remains unchanged. I will continue to refer unsubstantiated therapeutric claims to the ASA or Trading Standards. We will continue to criticise the PACE trial in the way that we have done in our letter to Psychological Medicine. Which other ME/CFS charities submitted comprehensive responses to the PACE trial recovery paper? Fourthly, the collaborative will NOT be raising money to set up yet another a research pot to distribute funding to researchers. It will NOT be promoting psychiatric research in preference to biomedical research. If this was the intention we would not have joined. If this were to ever to be the case we would not want to be a member. Fifthly, the MEA Ramsay Research Fund will not be changing its remit. It is there to fund biomedical research into cause and treatment. Our current projects include funding the ME Biobank (now in its second year of operation at University College London) and Disease Register (being set up at New University Buckingham), post-mortem research (building on the abnormalities, including dorsal root ganglionitis, already identified), a study on the pathophysiological mechanisms involved in post-exertional malaise, research into muscle/mitochondrial abnormalities and a sleep management study. At our last Board meeting we provisionally accepted a further item of biomedical research relating to the neurology of ME/CFS. Total funding for these current and future studies alone exceeds £200,000. As a patient support charity we are proud of what we have also been able to achieve in fundinfg biomedical research and will continue to do so. 120 researchers at the conference, plus another 20 others, which is a pretty impressive turnout. The current chair of the MRC’s Neurosciences and Mental Health Board (which is responsible for funding research into M.E.) 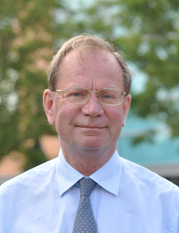 is Prof Hugh Perry, Professor of Experimental Neuropathology at Southampton. He was in the audience. This is very encouraging, especially as he has published on CFS before, and was involved in the MRC CFS/ME Expert Group, and gave a talk at last year's IiME conference: "An Overview of Neuro-inflammation in Chronic Disease"
Speakers from the MRC and the National Institute for Health Research (NIHR), which actually has a bigger budget than the MRC, emphasised that, while things have improved, there was an urgent need to create “more capacity.” In other words, to encourage more researchers from fields adjacent to M.E. to put forward proposals for research into M.E. ... Prof Holgate ended the day with a further call to the audience to apply for grants from the MRC and/or the NIHR. The MRC, in which he has been involved since 1995, really wants to see more proposals from researchers and is highly receptive. [about Stephen's talk]: [on role of technology etc: “A range of new science fields are beginning to impact on a complicated disease”. These new techniques will help us identify the differences between individuals and, similarly, help to identify M.E. sub-groups. To take advantage of these new opportunities requires greater pooling of resources and knowledge: “joined-up thinking,” as Prof Holgate put it. What this means is that we should not look at M.E. research in isolation from other similar – and often overlapping – illnesses. Studying these can often tell us a lot about M.E. Consequently, more and more medical research is grouped around themes. A good example is the cluster of ongoing M.E. research projects (ten, by my estimate) based in and around the Institute of Aging and Health at Newcastle University, headed by Prof Julia Newton. ...[later, re Zoe Gotts talk on sleep problems in CFS] Interestingly, as another illustration of a research theme, this work is being done under the auspices of the Northumbria Centre for Sleep Research. A young researcher from Northumbria University talked about her sleep research. So far, she had identified four different types of sleep (or indeed non-sleep) experienced by people with M.E. Prof Julia Newton talked about her work on the autonomic system. Her studies have shown demonstrably that people with M.E. have an autonomic dysfunction. Again, this research is not aimed at M.E. per se but is being done as part of her work on fatigue, as it is a generic symptom for many illnesses. Her colleague, Wan Ng, talked about his work on autoimmune diseases and how he believes that, in M.E., and other similar illnesses the immune system is not “switching off” when it should but is acting against itself. Professor Carmine Pariante at Kings College, London, is looking at what triggers the hyperactive immune system response in M.E. Life events produce stress which is often a trigger, and stress has a measurable biological impact. It is his earnest hope that, this time next year, there will be a second Collaborative conference in which the presenters will demonstrate evidence of new projects, new thinking and new researchers in the M.E. field. Thanks to Tony Golding for making these notes and to AfME for publishing them. Looking positive to me at last - thanks Simon. I think MEA should be at the table, which doesn't mean they should give in to the fake science. Quite the opposite. They must speak up against any fake science that is attempted within this collaborative. "It is the MRC initiative that has led to this collaborative mainly because it demonstrated to us that high quality work could be done.